Like many parts of the Colorado Front Range, the first residents of the area were Native Americans. The area was populated by a number of nomadic tribes, including the Ute, Cheyenne and Arapaho tribes. Because it was part of the Mississippi River Drainage Area, it was claimed for France by French explorer René-Robert Cavelier, Sieur de La Salle and it was named as part of “Louisiana” in 1682. The Spanish gained Louisiana in 1763, and returned it to France in 1801. This area of what is now Northern Douglas County, was in the Louisiana Purchase when it was sold to the United States in 1803. The Stephen Harriman Long Expedition of 1820 entered the area at the beginning of July 1820. That was the first documented exploration of the area by European or United States explorers. The Colorado Gold Rush brought people to Colorado in droves during the late 19th and early 20th centuries. The city of Denver, located approximately 12 miles to the north, grew considerably during this time. However, the area remained a series of farms and ranches, and many residents would visit the town of Littleton, a few miles northward, when they needed to purchase clothing, supplies, or other items. In 1978, a large parcel of land in unincorporated Douglas County was purchased by The Mission Viejo Company. As the suburbs of Denver expanded, the company desired to build a new planned suburb, called Highlands Ranch, in northern Douglas County, akin to its first planned development of Mission Viejo, California. Initial plans were drawn up, many of which are still being realized. These plans laid out several major streets and called for several schools and recreation centers, as well as a town center and public library. Large parcels of land were sold to private housing developers, such as Richmond Homes. As these developments appeared, they often carried their own names, creating a series of segmented neighborhoods throughout Highlands Ranch. Plans for Highlands Ranch also included a snaking “green belt” which provided for undeveloped land for recreation. The plans also allowed for a large number of public parks and bike paths. The first homes in Highlands Ranch were built in 1981, near South Broadway Blvd. Simultaneously, the state built a new beltway through the area, SH 470, which opened in 1985. Many of the first residents of Highlands Ranch complained about the initial lack of commercial development. Residents had to drive many miles (usually into Littleton) for groceries, entertainment, or medical care. The first public school, Northridge Elementary, opened in 1982. The same year also saw the completion of the Northridge Recreation Center, an athletic club available to all Highlands Ranch homeowners. The first secondary school, Highlands Ranch Jr/Sr High School, opened in 1987. This institution became solely a high school, named Highlands Ranch High School, in 1991 with the building of nearby Cresthill Middle School. The first Highlands Ranch branch of Douglas County Libraries also opened in 1991, housed in a strip mall off Broadway and Springer Drive. Over the next 25 years, the population of Highlands Ranch increasingly expanded. Highlands Ranch celebrated its 10th anniversary in 1991 with a population of 17,000 residents. Over the next ten years, Highlands Ranch continued to develop on a large scale. In 1997, The Mission Viejo Company was acquired by Shea Properties, which continued to expand the community. This included bringing a regional office of Lucent Technologies, and later in the same complex Avaya Communication, to the area. The year 2000 saw the opening of a much larger Highlands Ranch Library as well as the establishment of the Highlands Ranch Chamber of Commerce. Highlands Ranch is an unincorporated community. As such, it is officially titled “unincorporated Douglas County” (despite the appearance of the name “Highlands Ranch” on many maps). Highlands Ranch is ultimately governed by a three-member Board of County Commissioners. These commissioners are elected from three geographic districts in Highlands Ranch. The community utilizes police protection of Douglas County, contracts with the Littleton Fire Rescue for fire protection, and all public schools are part of the Douglas County School System. Most municipal services, such as the construction and upkeep of arterial roads, parks and open space areas, are performed by the Highlands Ranch Metro District, which is funded mostly by property taxes and state lottery funds. In addition, all Highlands Ranch residents are asked to sign and follow a community covenant as dictated by the Highlands Ranch Community Association or “HRCA”. This covenant places firm guidelines on such issues as housing decoration, fencing, and contribution to the area’s library and recreation centers. The Highlands Ranch Community Association obtains its funding through common homeowner association fees and covenant violation fines and, for this reason, is not usually recognized as a government, but rather as a local non-profit organization. Highlands Ranch lies within Colorado’s 6th U.S. Congressional District. For the purposes of representation in the Colorado General Assembly, the CDP is located in the 30th district of the Colorado Senate and the 39th and 43rd districts of the Colorado House of Representatives. Highlands Ranch is located at an elevation of 5,920 feet. 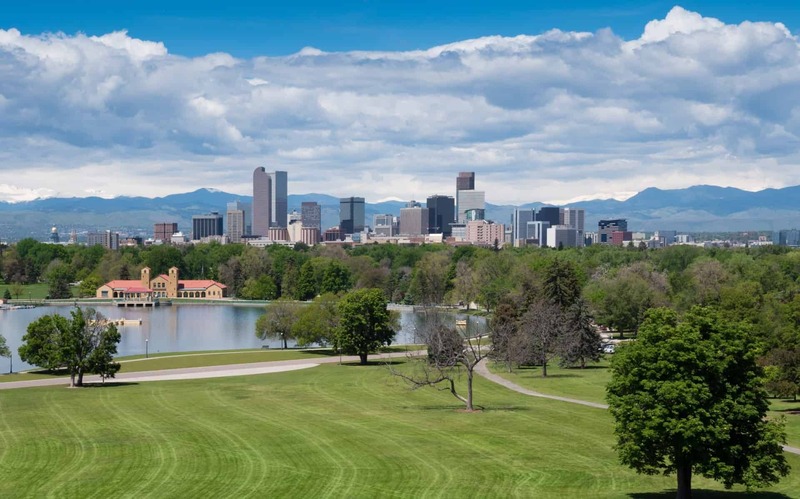 Located on Colorado State Highway 470 in central Colorado, Highlands Ranch is 13 miles south of downtown Denver and 13 miles north-northwest of Castle Rock, the county seat.